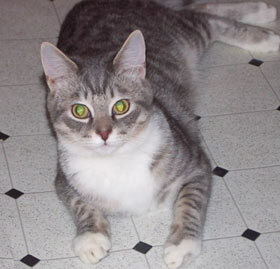 Finnegan, like his brother Guinness, is a friendly & low-key young fellow. He's very active, very sweet & 90% over his shyness. He's really come out of his shell recently, which means he's often plopping down, stretching out as far as he can reach & rolling around upside down looking cute. This should get your attention &, logically, some cuddles. Finn loves to play, whether it's chasing strings or his new favourite hobby, attacking the hand under the fabric. He also likes lounging around with the gang on the cat bunk beds. 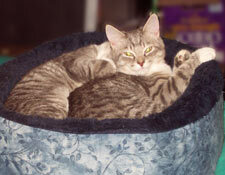 Finnegan & Guinness are a gorgeous silver grey pair of sweeties who'd like to get their own place to share. Together, they're double-wonderful!